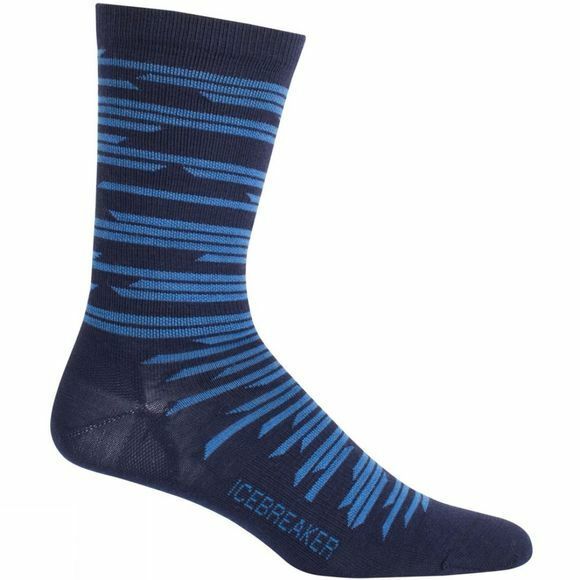 The Mens Lifestyle Ultra Light Crew Zig Zag Sock from Icebreaker are versatile, everyday socks that provide super-fine, super-soft comfort from the office to the back porch, the Lifestyle Ultralight Crew Zig Zag socks are a go-to choice for any day of the week. These versatile crew-length socks feature soft and breathable merino wool fibers with our seamless toe design and integrated arch support to provide all-day comfort. The addition of nylon fibers and a reinforced toebox and heel add long-term durability, and touch of Lycra provides active stretch and shape retention when you’re on the move.